Implementing e-government in local, regional, or central administration represents a far-reaching modernisation of governing the public affairs. Therefore, in training it is not sufficient to train users in new programs as in the case of f.i. further training in a new office application. To understand and actively influence the restructuring that, by necessity, goes along with the introduction of e-government a broader approach in e-skilling is needed. For Grabow, Drüke, H., and Siegfried (2002), e-skilling is one of the ten factors for success in local e-government. Schelin (2004) goes into the same direction when she points out: “With the era of digital government upon us, Federal, state, and local governments need to prepare their elected officials and employees to handle the multitude of changes incorporated into digital government. 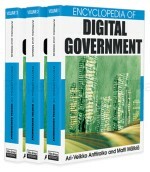 However, the lack of training opportunities, as well as the lack of research dedicated to training for digital government, is ominous for successful digital government endeavour ...” (Schelin, 2004, p. 273). Whereas Schelin in this encyclopaedia, presents the content and methods of an advanced training module this contribution focuses on the competencies that are required to enable the different user groups to be up-to-date for the new challenges that are ahead of them. In accordance to that approach in the first chapter the basic challenges that different user groups have to face when being confronted with e-government as a comprehensive modernisation concept.